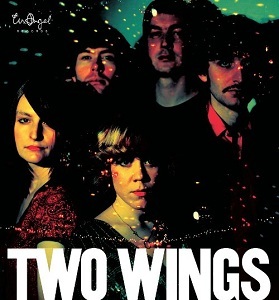 Two Wings are a band from Glasgow Born of a song-writing collaboration between singer/multi-instrumentalist/visual artist Hanna Tuulikki (Nalle, Scatter, The Family Elan) and guitarist/singer Ben Reynolds (Baby Dee, Trembling Bells, Alasdair Roberts, Tompkins Square Records), Two Wings line-up is completed by vocalist Lucy Duncombe, bassist Kenny Wilson and drummer Owen Curtis Williams. With the addition of a brass section the band have now recorded their debut album - Love's Spring. This is definitely a hard album to review as it's a difficult one to categorise or describe, other than to say it's got quite a haunting and bizarre feel to it at times. There's folky parts, 50s rock and roll influenced bits - generally a whole mix of styles. There's a lot of variety in the music, and it's one of those albums that grows on you the more you listen to it. The vocals are likely to be a bit off-putting at first, but it's definitely worth persevering - "Love's spring" is a very good album and wone that's definitely worth listening to a few times. "Love's Spring" will be available on March 12th via Tin Angel records.